Episode 67 - On the previous day, Duryodhana was quickly losing faith with his uncle. 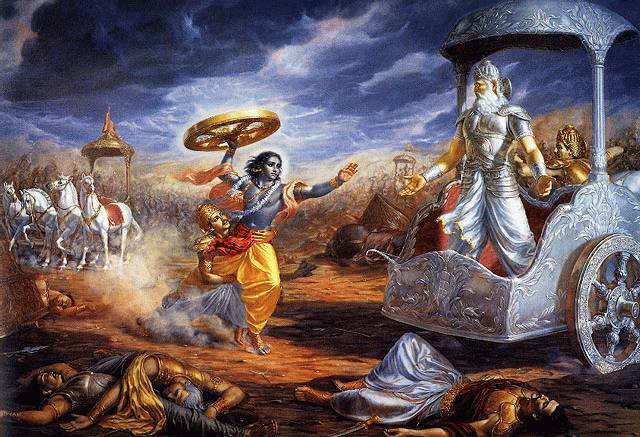 He began to suspect that Bhisma was throwing the contest in favor of the Pandavas. Karna didn't help any when he offered to take charge in place of the old man. So Duryodhana asked the old man to either fulfill his oaths or get out of the game. Now today, on the 9th day, Bhisma sets out to finish off his Dharma so he could move on to the next phase in his life. On the battlefield, he kills hundreds of thousands, including the entire nation of the Saumakas. Bhisma takes out a large chunk of the Pandava army. If he keeps this up another day or two, there will be no one left to fight on the Pandavas' side. I started listening a little late - but I am finally caught up! I am watching the episodes on youtube that you mentioned (the ones made in the 80's) - and reading the story - so your podcast is really helpful to clarify any things I missed or misunderstood. Will you move on to other Hindu texts when you finish with this one? News: Episodes 1-4 have been re-issued!